In the past week, I rode out an earthquake and a hurricane with no ill effects, and took that advantage to observe how others handled the crisis communications and media relations that comes with such a set of disasters--particularly the crisis communications done on social media. Spokesperson by Skype, the new remote availability: Communicators like Washington, DC's Metro spokesperson Dan Stessel used Skype to do live remotes with local area television stations throughout the night of Irene's path through the nation's capital, and as ^DS in @wmata's Twitter feed. His hurricane hallmark? Refuting rumors with a calm, non-anxious manner. Despite the rumors, Washington's Metro system stayed open throughout the storm. Spokesfolks weren't the only Skypers in the storm--local television reporters in Washington shared footage from their home locations throughout the area during the wall-to-wall coverage in live Skype remotes. Sounds like now's the time to get all your spokespeople--experts as well as communicators--experienced on Skype and ready to use it well before the next crisis hits. Count on this as one of your major channels to reach local television and others during a disaster, if you haven't already considered it. Don't tweet and run: After a midday hurricane press briefing in New Jersey, in which Governor Chris Christie cited the death of a firefighter, the Princeton, NJ, township police department tweeted that the death report was inaccurate. And when you want to refute the governor, you can expect questions to follow. So it should not have been a surprise that Twitter saw immediate questions from reporters at the briefing, including the New York Times's Jennifer Preston, who waited an hour for clarification on Twitter. If you're going to pounce on a correction, fine--just be available for immediate questions and followup. Communicators can benefit from looking at what reporters say about correcting the record in real-time on Twitter. 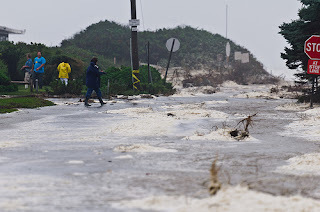 Timeliness is next to godliness, even more than before: At 9 am Sunday, when the worst of Hurricane Irene was roaring into New York City, Gizmodo reported on these actually useful tips from the Federal Communications Commission on using a cellphone during a natural disaster. The problem? While they arrived on Saturday, they were issued in PDF form, not easily shareable, so Gizmodo cut and pasted them into its Sunday post. Communicators, don't make those types of technical barriers stand between your good information and speedy passage to your audiences, especially in an emergency. And get these kinds of evergreen tips out in advance of the storm--while people still have battery power to see them, eh? One thing I know about crisis communications: You can always do better. What did you observe about good--and unfortunate--communications during the hurricane? Share your observations, leads and links in the comments.